Flash、Web Standards and Interaction Design. There is one useful plugin in firefox called 'all in one gesture', and I use the backward or forward gesture most of the time while surfing online. 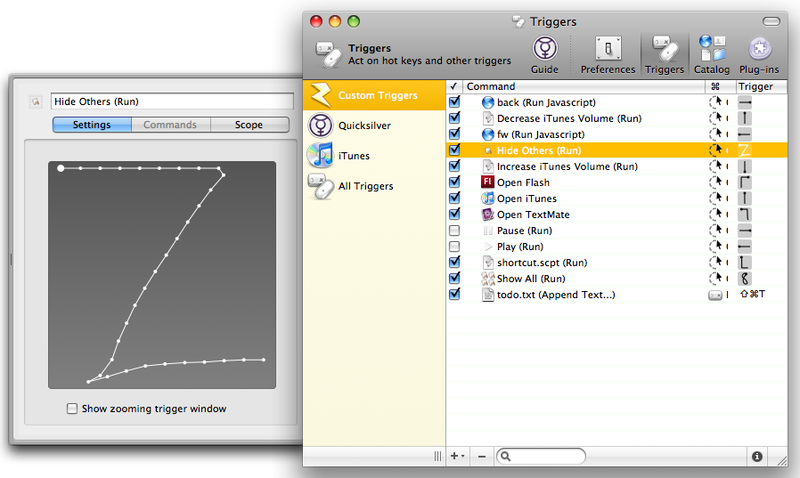 Unfortunately safari doesn't support this kind of plugins. These days I happen to find a quicksilver plugin--abracadabra, which let you do anything quicksilver can do with mouse gesture. If you have installed abracadabra in quicksilver, simply drag these two link(back , forward) to your safari's bookmark bar. 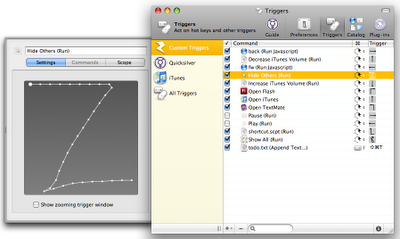 Then create the new gesture triggers in quicksilver and locate to safari>bookmarkBar>back(or forward). Now you can custom a gesture which you want the back or forward action to take effect. This is handy and make your safari more friendly.